Playing in rainy conditions, Horton Smith sank a 50-foot chip-in for birdie at No. 14, and a follow-up birdie at No. 15 to win two of the first three Tournaments.Due to adverse weather conditions, the first round of play was postponed until Friday. Sunday's play was also postponed and the third and fourth rounds were played on Monday. 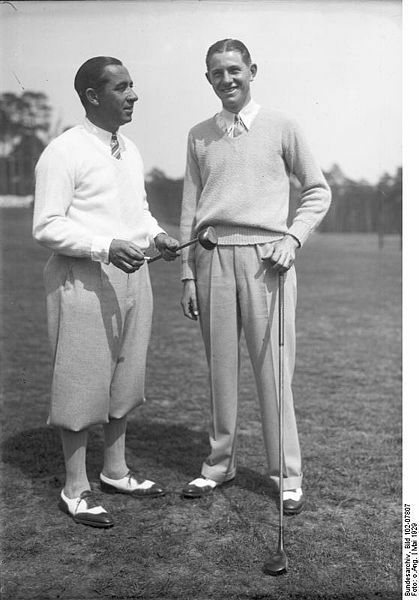 The winner of the first Masters in 1934 was Horton Smith. The winner of the third Masters - this one, the 1936 Masters - was Horton Smith. Smith thus became the first two-time winner of The Masters. "Lighthorse" Harry Cooper held a three-stroke lead entering the final round, but managed only a 76. Smith caught and passed Cooper by shooting a 72 that included back-to-back birdies at Nos. 14 and 15 in the fourth round, the birdie at 14 coming on a 50-foot chip-in. Cooper is credited with 31 PGA Tour wins, but never won a major despite several close calls. Weather played havoc with the 1936 Masters, forcing a 36-hole finish on Monday.